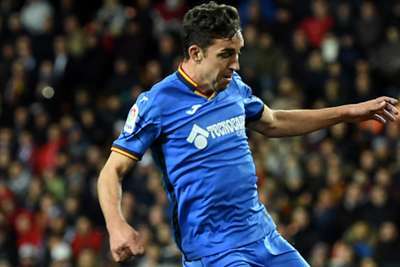 Jaime Mata admits his call-up to the Spain squad is "a bit of a novelty" but is determined to make the most of his chance under Luis Enrique. The 30-year-old earned a place in the senior set-up for the first time in his career following his fine form for Getafe in his first season at the club. Mata's 13 goals and six assists in 25 appearances in 2018-19 have propelled Jose Bordalas' side into an unlikely challenge for a Champions League spot. And, having spent much of his career outside Spain's top tier, Mata is now eager to make the most of his chance at the very highest international level. "It's a bit of a novelty," he told reporters in the build-up to Spain's opening Euro 2020 qualifier against Norway on Saturday. "It's an unusual case to reach the highest level at my age, and with my career going through all the leagues and reaching LaLiga later than the rest. I'm adapting to the rhythm and my team-mates and I'm happy." When asked what advice he would give to other more experienced players hoping to emulate his achievement, Mata replied: "I'm nobody to give advice. "You have to enjoy every stage of your footballing life as if it were the best thing to be in the category you are. You have to enjoy the day and to work with the greatest enthusiasm. Your career also depends on outside factors, not just you. "Age in the football world is not as important any more. Every player takes much more care of himself, the food is better, the rest - all of this makes a sportsman's life longer. Now, being 30 is not like it was a few years ago."